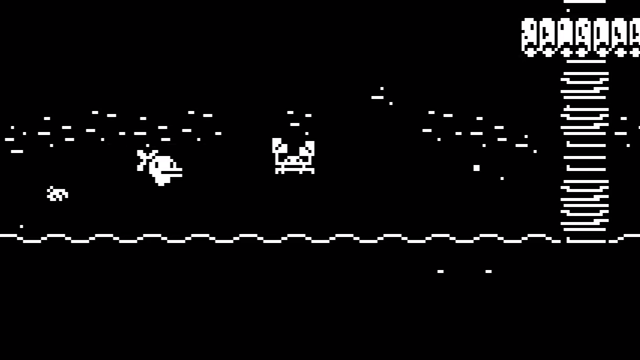 Not much is known about Minit, but it's being developed by bunches of known factors among the peeps of gaming: Kitty Calis (Action Henk), Vlambeer-ian Jan Willem Nijman, musician Jukio/Kuabee (formerly Kozilek), and Dominik Johann (Dr. Langeskov, The Tiger, and The Terribly Cursed Emerald), and it's being published by Devolver Digital, a studio with a pretty solid track record when it comes to choosing indie games for publication. The game is an action-adventure with limited visuals (I'm counting about 2 colors here) starring a vaguely ducklike fellow who begins his adventure after finding a sword on a beach. You speak with NPC's, slash critters, water your garden, and take the occasional nap. The game is coming to PC in 2017, and possibly consoles.